This set coordinates with Reveal Wheel to create an interactive card that reveals different sentiments as you turn a wheel. 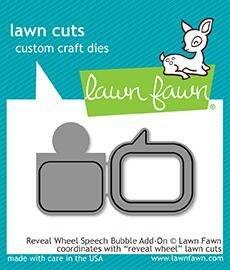 Check out Reveal Wheel Sentiments for messages that are sized perfectly for this window! Coordinating set ideas: Use this set with Reveal Wheel, Reveal Wheel Sentiments, and Screen Time to make a cute interactive card with a girl/boy “texting” hello in different languages. Or use it with just about any set to make a cute “talking” character! speech bubble: 1 ⅛" x 1 ⅛"